When I went back home to Germany for a visit, I met with an old friend in a fun restaurant by the river. The place is called Oosten. Even though there is no adjacent parking, the place was packed. It is located in front of the EZB. 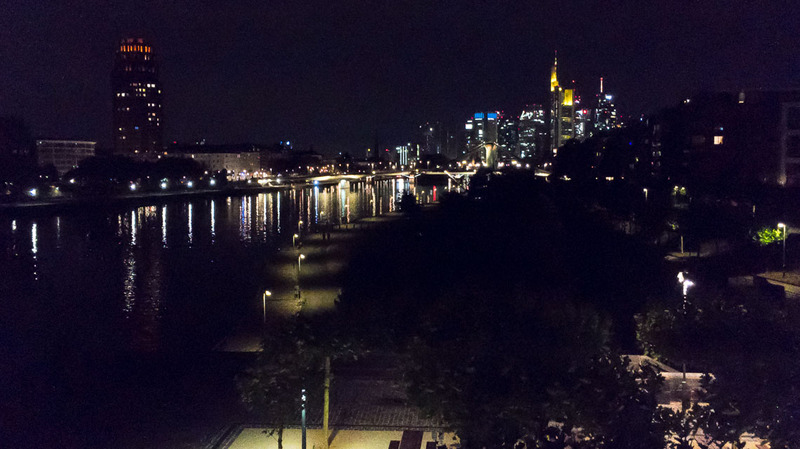 When you go to the roof, you will be rewarded with a fantastic view of Frankfurts skyline. On the left-hand side, you can see parts of Sachsenhausen. Towards the right are the downtown’s skyscrapers. I only had my iPhone. I placed it on the railings to stabilize it a bit. Of course, a tripod nowhere to be found. Shot in DNG format, I applied some noise removal during post processing, tweaked exposure a bit and cropped. The result is a reasonably sharp image. To learn a bit more about Frankfurt, click here.